Rack mount network time server. 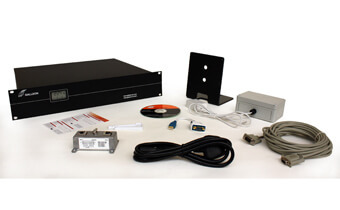 The TS-900-MSF Network Time Server solution consists of an MSF clock, MSF antenna and NTP software (TimeSync). The MSF clock is attached to windows PC and the supplied TimeSync software once installed configures the machine as a Stratum 1 NTP time server. A two line display on the TS-900 unit shows run-time information for the MSF subsystem and UTC time. MSF time reference input + 5m cable. Email warning if MSF synchronisation is lost. TS-900-MSF unit + Power Lead. MSF Antenna + power supply.